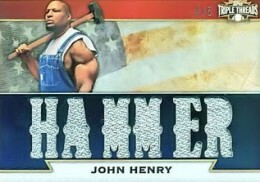 For a fictional character, John Henry, the steel-driving man, is causing a very real headache for Topps. It turns out the alleged model for the card was a former Topps employee who was relieved of his duties before he gave explicit permission that his image could be used. 2011 Topps Triple Threads Baseball had a trio of gimmick cards for fictional characters John Henry, Leif Ericson and Pecos Bill. While just five of each were made, many collectors felt they didn't have a place in a high-end product. They didn't want "relics" for a figure from a tall tale in a third-grade reader. Even Mark Sapir, Topps' Vice President of Marketing for Sports & Entertainments, voiced some concern about the card's inclusion during a Cardboard Connection Radio interview last fall. At the time, his comments made me chuckle. The card was, if anything, just a minor headache for Topps. Their low production run probably meant that they sold well on the secondary market. The detractors forgot about them and moved on. But now that minor headache has the potential to become a full-blown PR migraine. Former Topps employee Christopher Holmes, the alleged model for the card, just filed a lawsuit against the card maker. According to the lawsuit, Topps took a picture of Mr. Holmes for a "trading card promotion that Topps was contemplating," but did not tell him exactly what it was for. In his complaint, Mr. Holmes states that he did not give Topps permission to use the picture, especially when they portray him as a former slave. To make matters more interesting, Mr. Holmes alleges that he was fired before the card was printed. Legal Translation: Mr. Holmes' argument boils down to this: They took my picture. They fired me. And then to humiliate me, they used the picture without my permission, and called me a slave. I could see that getting traction with a jury. Obviously, Topps' position will likely be, "Heck, we made him a legend!" I can see that getting traction with a jury, too. Normally, a case like this boils down to a close analysis of the worker's employment agreement. Add in claims of disparagement with racial undertones, however, and this case becomes more complex. It's too early to predict a winner since we have yet to learn Topps' position. Hopefully, in the next filing, Topps will give its side of the story. Regardless, I can't help to think that, somewhere in the Topps marketing and legal departments, there are a few people slapping their heads right now saying, "Who thought that card was a good idea?" Headaches may be contagious at Topps over the next few days. Download the official court filing for the case. HA! HA! Serves Topps right. It’s pretty simple how this will end. Topps will settle for a few hundred grand – that’s it. Does anyone think this is anything more than a money grab that Topps will pay and push off to the side? I agree with Chris, this is funny. I hope TOPPS gets their due on this one. Please keep us updated.